Primitive Saltbox Sampler Hand Painted Tissue Box Cover. Here is a year round Saltbox design, in what I call quilted sampler tissue boxes. 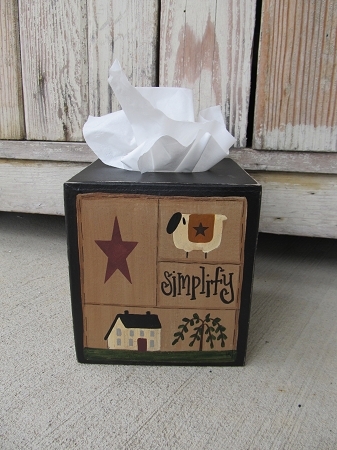 This paper mache tissue cover features a saltbox house, willow tree, sheep, star and the saying Simplify. Sturdy paper mache. Covers a boutique style tissue box, size is 5 1/2" x 5 1/2". Hand painted, designed and signed by Heidi. Color choices are available for sides and top of box. Shown with black. Other seasons are available, see our web site in each season or search on the web site "SAMPLER"